Today we are looking at how to work trailing. 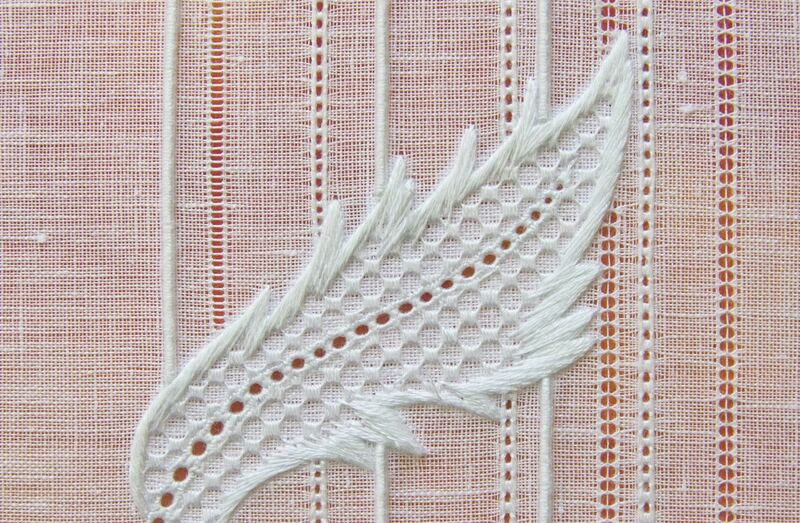 In the image above it is the thick, heavy, vertical lines behind the leaf.Trailing is traditionally a whitework stitch that is often used for outlines worked as a single line. It is worked by having a number of core threads and then couching over the top of those core threads with another thread. 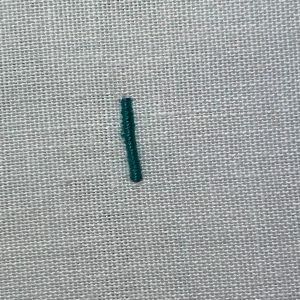 The stitches are continuous and cover the entire core thread, unlike normal couching. 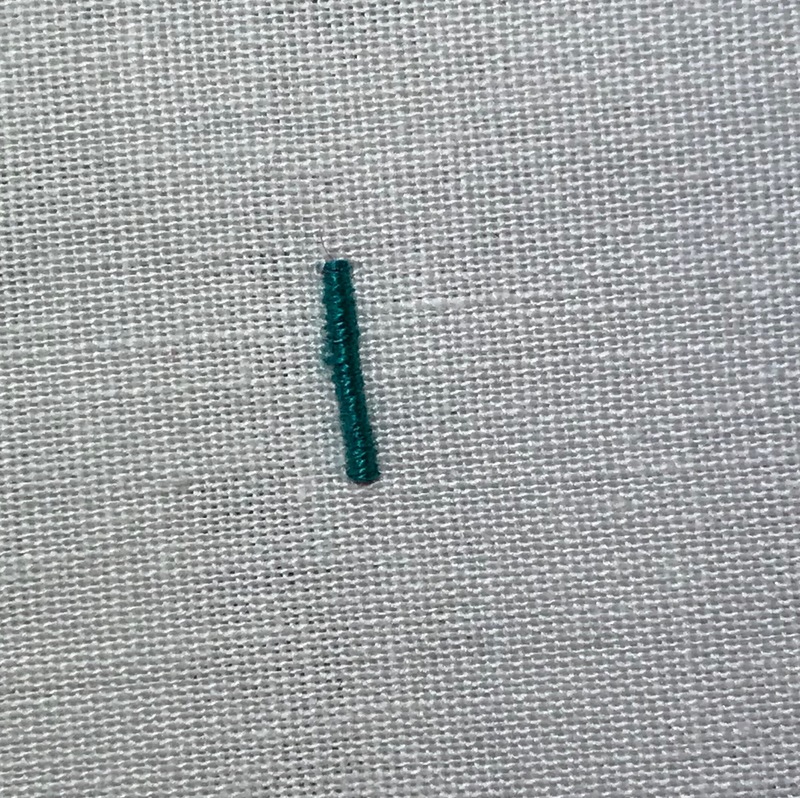 Now like I said, traditionally this would have all been worked in white but that’s not the easiest colour to photograph and I wanted you to be able to see what I was doing so my core threads are in pink and my couching thread is in green. 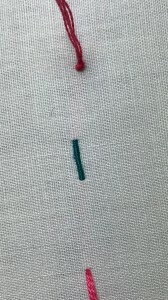 I am using a stranded cotton as this gives a nice, smooth finish, but you can work it in any number of threads, such as a cotton a broder or a silk. 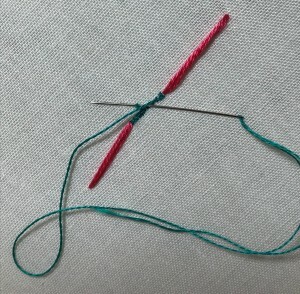 Chenille Needle (size depends on how heavy you want the trailing to be). Set up your ring frame with your fabric in as usual. If you are working a specific design, get that transferred on too. 1. Take a length of stranded cotton 15cm longer than the length of the line you will be stitching. 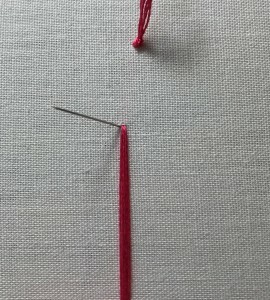 Separate the strands and thread through the Chenille needle. 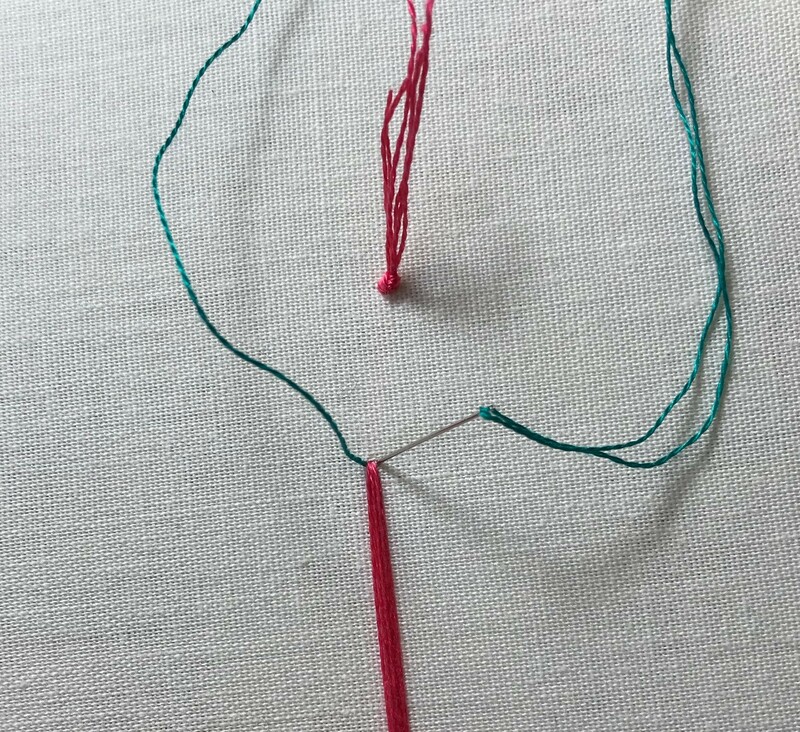 In my example I am using 6 strands of stranded cotton. If you want a thinner and more delicate line then you can use less and if you need a thicker line you can add more strands. Have an experiment and play to see what you prefer. Tie a not in the end. 2. 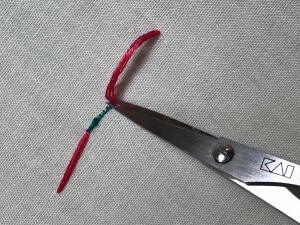 Thread the No.10 embroidery needle with a single strand of cotton and secure on the design line with a knot on the top and 3 small stitches. Cut the knot away. 3. 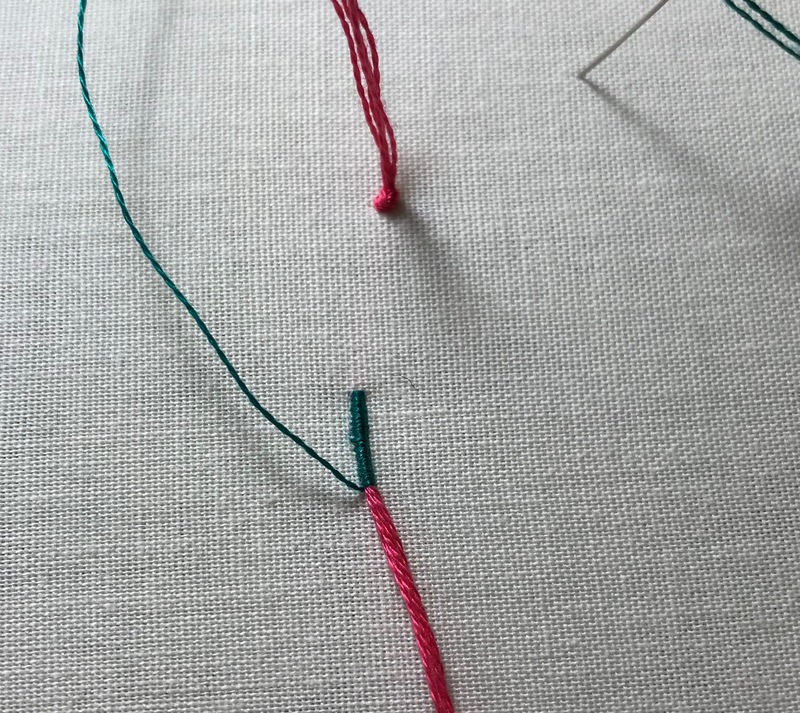 Take the Chenille needle down on a design line about 3cm away from where you would like to start the trailing and then bring the same needle up at the start of the design line you wish the trailing to run. 4. Bring the no.10 needle up to the left hand side of the pink core threads. 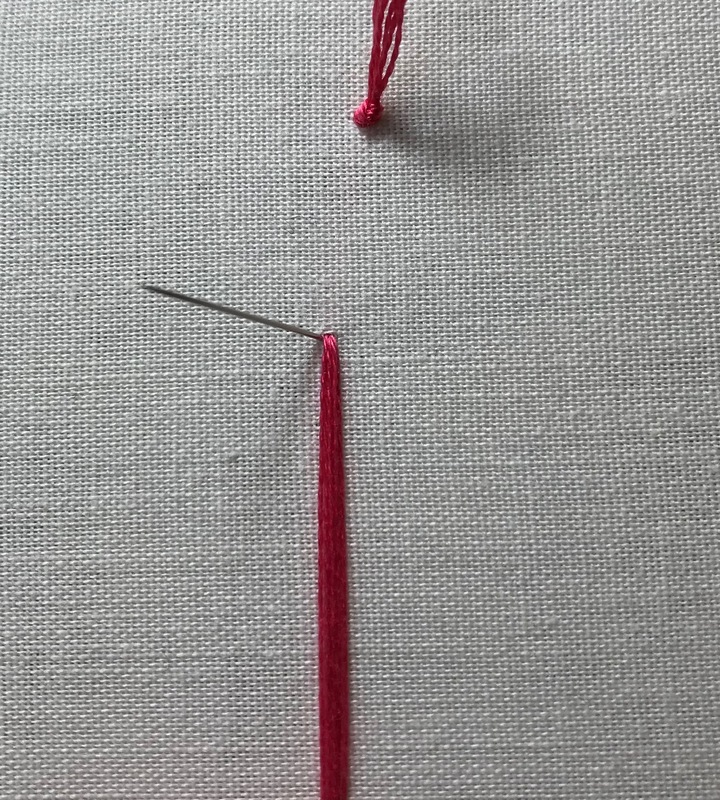 Make sure it is coming up from underneath the core threads and the needle is angled out towards the left at 45 degrees to the fabric. 5. 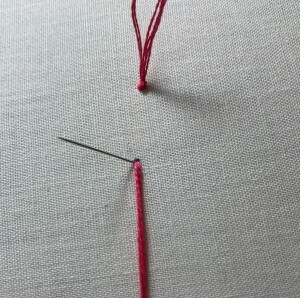 Take the needle down on the right hand side, over the core threads again angling the needle underneath the threads at 45 degrees. 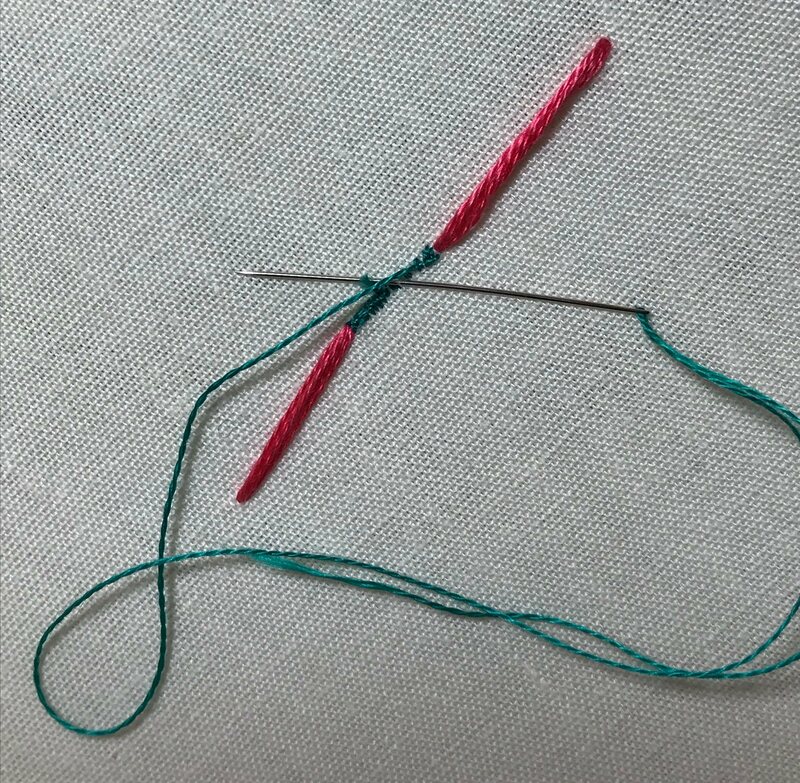 It is this sharp angling of the needle that produces a lovely rounded effect to the trailing and stops it from looking flat. 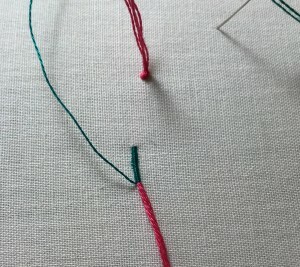 6.Repeat the same process next to the first stitch you made. 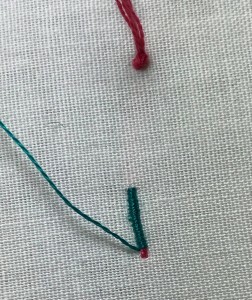 It is important that there is no core thread visible. If there is a bit of core thread visible at the start, come back and work a stitch at the start so there is no core thread visible. 7. Continue working in this same way along the length of the line. Remember to angle the needle underneath the core threads and keep each stitch next to each other to create a smooth finish. 8. When you reach a couple of stitches before the end of the line. 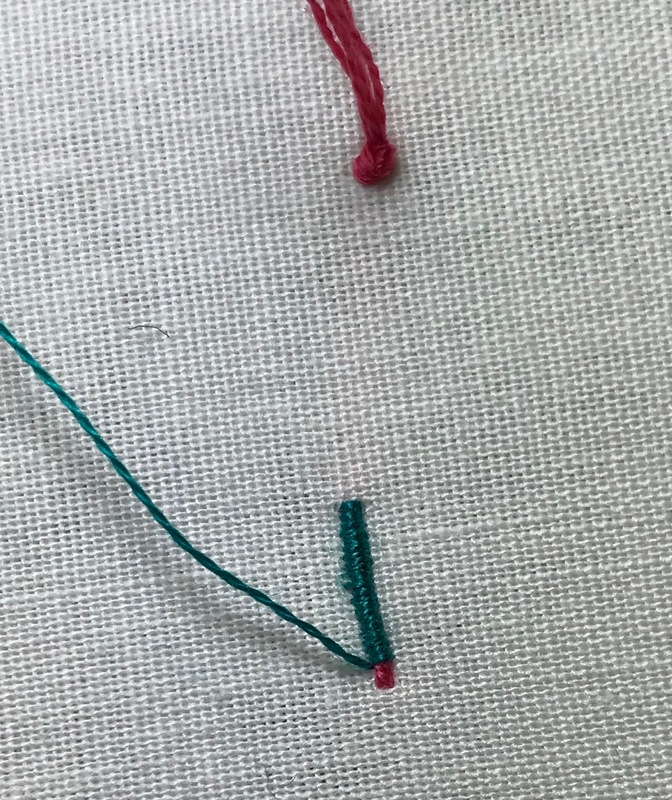 Take the core threads down and bring the needle back up a 3-4cm away on another design line. 9. 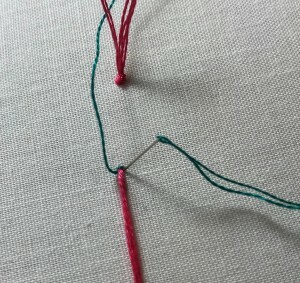 Pull the core threads tight with one hand and continue to work the small couching stitches until the end and all the core thread is covered. This will be enough to hold the core threads. 10. Turn the fame to the back and finish off your couching thread. 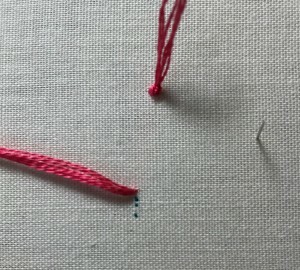 Here I am weaving it through the stitches on the reverse. 11. Cut the two core threads from the reverse close to the couching stitches. There you have it, a beautiful, smooth line of trailing. TIP: You can if you wish taper your trailing as you go so it gets finer. 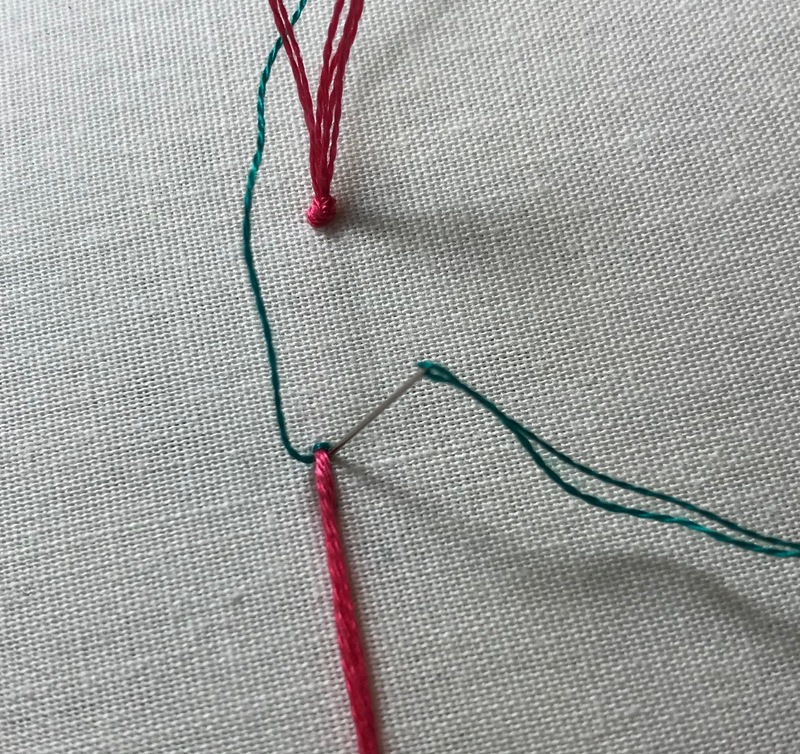 Take one core thread at a time through the fabric before you reach the end, making sure that they are staggered so that the transition is smooth. I hope this has been a helpful tutorial, any questions then just pop them in the comments. Thank you so much. Would appreciate if you can let me know the fabric you have used in your first sample. Thank you for your question. The sample at the top is 60ct Cambric linen. Lovely work— I would be worried the core would pop out onto the right side. Do you never secure it on the back? Thank you. No doing those few stitches extra either end helps keep it in place.